"Without me, Super-Man Zero, there would be no you. Without me, there would be no superheroes at all. For I am the very beginning." In June of 1938, National Allied Publications began a new comic-book series, featuring several different heroes. A new character created by two young men from Cleveland was featured on the cover. 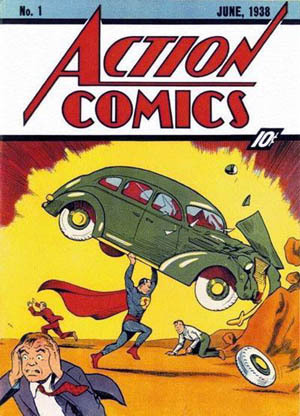 The comic was Action Comics #1, and the character was Superman. Thus began The Golden Age of Comic Books. Throughout the Golden Age, comics as a medium were not yet synonymous with superheroes as a genre — horror stories, funny animals, mystery-solving detectives, Westerns, romances, and more all remained popular throughout this period, in some cases more popular than superheroes. However, the gradual rise of the Super Hero defined the Golden Age in many ways. The Super Hero had Proto-Superhero antecedents that went back beyond Superman — indeed, Superman was in large part a product of these — but they had never come together in this way before. The two-fisted pulp action hero merged with science fiction and fantasy, which merged with the crimefighting vigilante, which merged with ancient heroic sagas, to produce an explosion of new characters, individual men and women with strange abilities and the responsibility to use them against evil. The first Super Heroes were generally Superman ripoffs. Characters like Wonder Man, Flash Lightning, and Dynamic Man, with the full set of beat-bad-guys-up powers, proliferated quickly. In fact, DC sued Wonder Man's publishers, Fox Productions, for copyright infringement, and won. Probably the most popular character of the Golden Age was not Superman, but Fawcett Comics' Captain Marvel; at its height, Captain Marvel Adventures was published weekly and sold 1.3 million copies per month, and the Marvel Family included Mary Marvel, Captain Marvel Jr., the three Lieutenant Marvels, Uncle Marvel, Freckles Marvel, and Hoppy the Marvel Bunny. Eventually, more specialized heroes started showing up. The Flash, with the ability to run faster than anyone else (incidentally the first hero with only one power); Doll Man, with the ability to shrink down to six inches high; the Human Torch, with the ability to become living flame. These, in turn, received their own imitators, and a wide range of characters and titles were thus born. (Almost universally in Golden Age comics, each issue contained several short stories, each featuring a different hero. Only the biggest characters got their own books, and even they usually had back-up stories featuring other characters.) Also popular were the pulp heroes themselves, translated to four colors. Based on precedents like Zorro and The Scarlet Pimpernel, these were usually Badass Normals, occasionally with a gimmicky weapon but often with just their fists, who took out racketeers, white slavers, and saboteurs with aplomb. They often wore cap-sleeved leotards, finned cowl masks and buccaneer boots. Batman sprang from this breed, crossed with a dash of the crime-chasing detective. This was also the era of the Sidekick. After Robin was introduced in 1940, nearly every hero picked up a young lad or lass to assist them in crimefighting. The Human Torch had Toro; Sandman had Sandy, the Golden Boy; Bulletman had Bulletgirl. Plucky Comic Relief adult sidekicks were also popular; they were usually fat and clumsy, like Green Lantern's Doiby Dickles or Plastic Man's Woozy Winks. This being prior to the concept of political correctness, a few regrettable characters showed up here as well, especially the Whizzer's "Slow Motion" Jones, a chubby black man with huge lips and a heavy drawl. Incidentally, this age during World War II was also a Golden Age for Canadian comic books since foreign comic books were banned from importation during the war under the War Exchange Conservation Act. As a result, a handful of domestic comic book publishers produced original material that would be called the Canadian Whites, since these publishers largely could only afford to publish black and white comics. Titles included Wow Comics, Nelvana of the North, and Johnny Canuck, while one company worked out a deal to produce Canadian Captain Marvel with Canadian artists redrawing American stories with the original scripts. Unfortunately, when the war ended, the import restrictions were lifted and the resulting flood of American comics quickly put the Canadian ones out of business. The precise end of the Golden Age is vague. After World War II ended, Super Hero comics became less popular, with other genres such as funny-animal comedy (which had already been outselling it), crime fiction, teenage romance and westerns replacing it. As the 1940s moved on, more and more titles either changed genre or were canceled altogethernote An extreme example is "Moon Girl", starting out under that title as a superhero comic, it changed within the span of a few issues to the more "real crime" "Moon Girl Fights Crime" and within a couple more issues to "A Moon, A Girl — Romance!". In 1950, the last Timely (later to become Marvel Comics) superhero title was canceled, and in 1951 the last Golden Age adventure of the Justice Society of America went by. In 1954, Dr. Frederic Wertham published the book Seduction of the Innocent. It argued that comic books were responsible for corrupting the youth of America, leading them to juvenile delinquency and sexual perversion (if comparison to later criticisms of rock music, Dungeons & Dragons, and video games comes to mind, that's not surprising). This led to the creation of the restrictive Comics Code Authority, which forbade comic book stories that included moral ambiguity, more than minimal violence, or practically any portrayal of sexuality, resulting in comics that were much more strictly and consciously kid-oriented than before. If the Golden Age wasn't already dead by that point, the Code was the last nail in the coffin. The Arrow, the first archer superhero - predates Green Arrow and Hawkeye! Detective Comics (Batman). The oldest continuously running American comic book series, though between 2011 and 2016 it was renumbered after a linewide reboot before resuming the original numbering at #934. The early comic book issues of MAD. Domino Lady, the first female masked vigilante - published in 1936. Fantomah, the first powered female superhero in comics. She was a blonde woman who protected the jungles of Africa, able to turn into a terrifying skull faced monster/goddess. Vampire, one of the few Australian super heroines. Despite the name, she had more in common with someone like Batman than Dracula. A revival is in the works. The Original/Android Human Torch: The first Marvel superhero alongside Namor the Sub-Mariner. Similar to but unrelated to the later and more famous Human Torch. Usually accepted as lasting from the publication of Action Comics #1 to the early 50's. 1938~1950. End of an Age, The Time of Legends, Nostalgia Ain't Like It Used to Be.